For some patients, a lack of mobility can make everyday task such as leaving, entering or changing in position in bed a challenge. Whether the user is transferring to a commode or wheelchair or even just trying to sit up in bed, the Sidhil Elland Short Grab Handle is an ideal piece of equipment to provide the assistance and increase independence. By using this short grab handle, users can maintain their independence and alter their position without needing a carer's aid, and since the handle is shorter than standard grab handles, it is accessible for those lying down. The height of most grab handles can make them difficult to use for some patients who are lying down, meaning some carer assistance is still required. 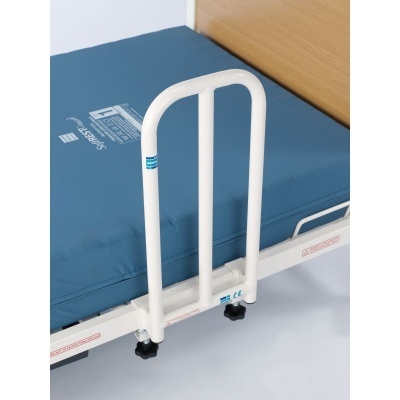 Since this Short Grab Handle is at a lower height, it is fully accessible to patients in lying positions, allowing it to assist with transfers from a lying to standing or sitting position. Please be advised that the Sidhil Elland Short Grab Handle is usually delivered within 1 week of your order being placed. We would advise you to consider this delivery estimation before placing your order. For more information, please contact our Customer Care Team at 020 7501 0592.